Photographing the garden in the fall is very different from summer. In the summer I must get out there early before Mr. Sun shines his death rays. But now the sun is very slanted and I face new challenges, for this beginner photographer anyway. Still, it allows for new perspectives and fall light has always been my summer savior. 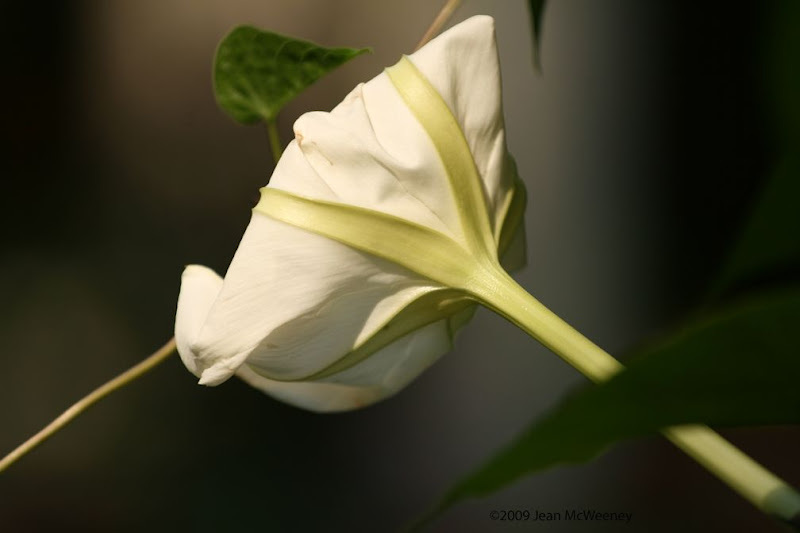 Moonflower starts to stay open longer as the mornings cool down. Grasses start to show off now. This muhly (Pink or Gulf; I'm not sure which as they were gifts) is not at its peak yet but starting to get there. Inland Sea Oats seedheads, which were cut off right after this photo was taken to prevent too much self-seeding. 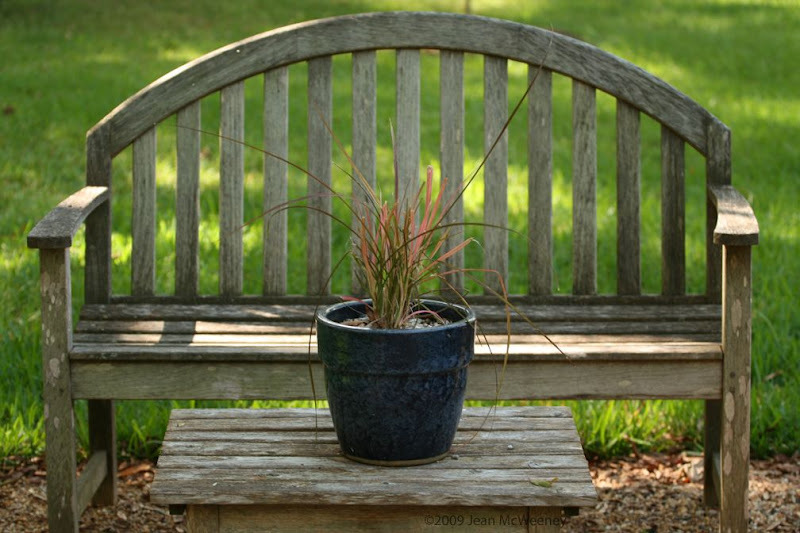 'Fireworks' (Pennisetum setaceum rubrum) is surviving the neighbor cat's constant chewing. Maybe next year I can get it to really shine. But I just gotta figure out the cat thing. 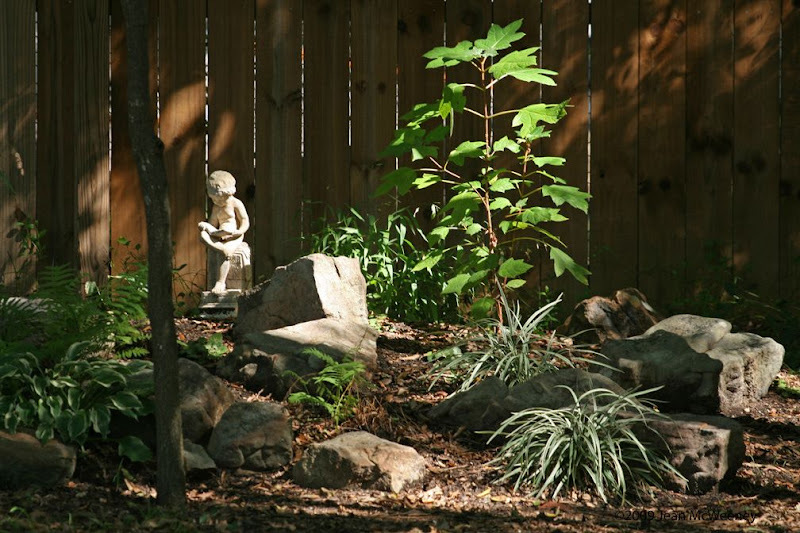 The slanting light is challenging my photographs of the woodland garden. 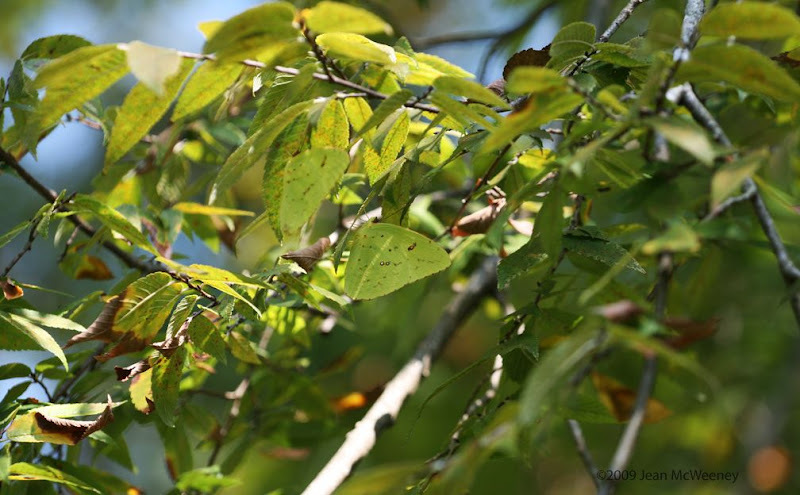 Speaking of challenges, can you find the two Cloudless Sulphur butterflies amongst the leaves? I'm not an expert butterfly ID'er but I think that's what these are. The butterflies are there, believe me. 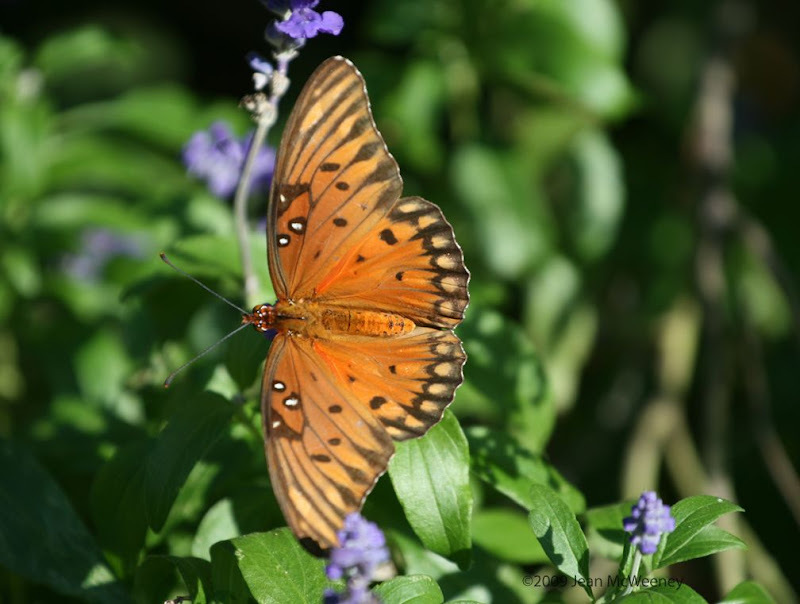 The Gulf Fritillarys are all over. The challenge with photographing all butterflies, besides the fact that they don't stand still, is that they're mostly out in the bright sunshine of the afternoon. I think I prefer the underside of the Gulf Fritillarys most. This one's on 'Victoria Blue' Salvia. I hope to capture more butterflies in the near future, if they'll only hang around a while for my camera. Wish me luck! I love your butterfly pictures, especially the Cloudless Sulphur one. They really do blend into the leaves, don't they. Beautiful shots. I love autumn light too. It makes everything glow. Your photos of the butterflies are great, and yes, I did finally find that second butterfly! 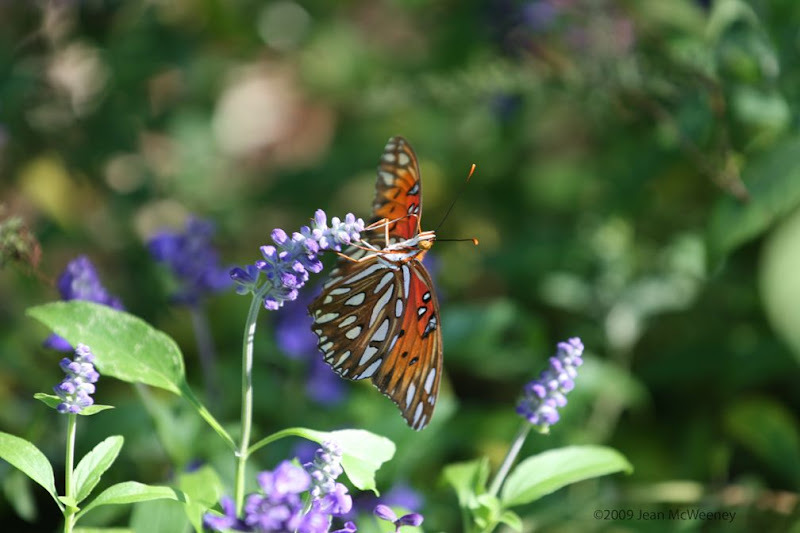 Beautiful shots, I love the underside of the Gulf Fritillary on your salvia and the dreamy shot of the bench. 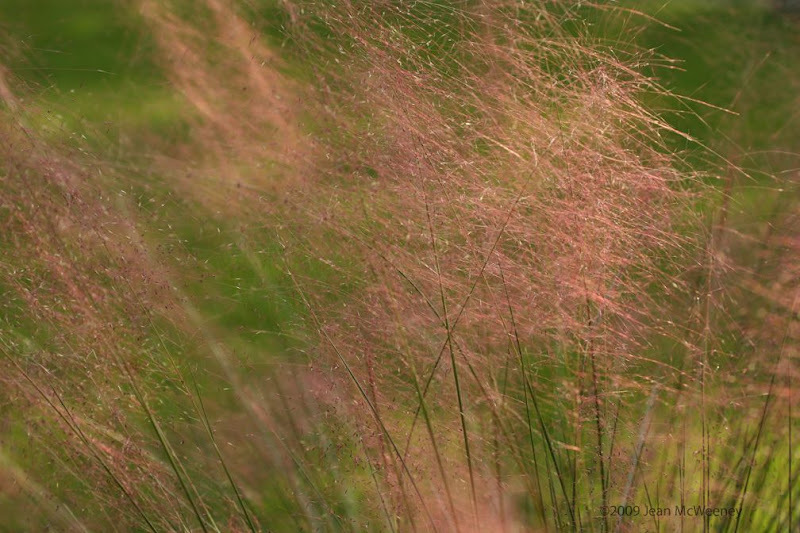 The pink muhly grass looks like an inpressionist's painting. And the two Cloudless Sulphur butterflies? I see 'em but it's like a where' Waldo game. I enjoyed your photos, Jean. The fall light is indeed a blessing, in more ways than one. It's just so much more comfortable when the sun turns back into the sun instead of the Death Star. 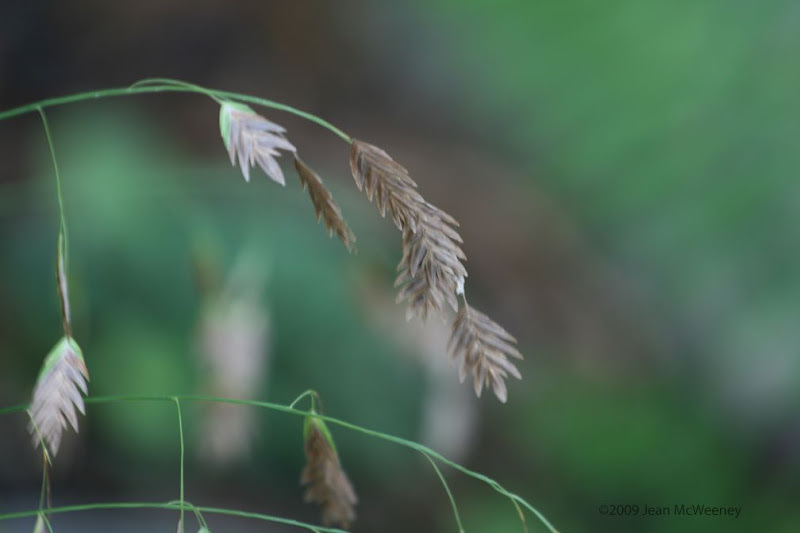 it is so true about the grasses in the fall. I love the Gulf coast Muhly- a sea of pink foam, and the inland sea oats bending in the breeze. Your butterfly pictures are lovely. How do you get them to sit still. Jean, For a "beginning" photographer, your photos are stunning. Great capture of all the butterflies--I find it very hard to catch them standing still. Even when they're sipping nectar from a flower, their wings keep moving. The fritillary is just beautiful. Oh, I love, love, love the photo of the moonflower! I think it is so fun to play with light and shadow in photographs, it almost forces an artistic quality to the pictures. I'll have to pay more attention to the light differences between the seasons. Your photos are great! Of course the ones with the butterflies are my favorites. Thanks for your nice comment on my blotanical win post. I like how you just did the small gracious thank you on your sidebar. Great shots! I envy your luck with the moonflower; mine went nowhere this year. Lovely photos - thanks for sharing once again! Those Sulphurs do blend in with the foliage ... there are quite a few of the sunny darlings on my corner of Katy lately!